Dr. Carol Dweck’s research and writing on mindsets and motivation have greatly influenced my thinking. In her studies, Dweck found that people who believe intelligence and talent are fixed tend to remain within what they perceive of as their aptitudes. They will not push up against those boundaries; their framework for learning is “fixed.” Other people with “growth mindsets” believe that intelligence and talent can be “grown.” These people will be more open to experimenting, taking risks, and learning new strategies in order to further develop their capacity. She also notes that people have both fixed and growth mindsets in various contexts. On his blog, George Couros, the author of The Innovator’s Mindset: Empower Learning, Unleash Talent, and Lead in a Culture of Creativity (2015), launched a number of conversations about the deeper meaning of a “growth mindset.” He has conferred with Dr. Dweck regarding his thinking. In his post “A world that is asking for continuous creation,” Couros offers a way to look at mindsets through an innovation lens. As Couros notes: “As we look at how we see and ‘do’ school, it is important to continuously shift to moving from consumption to creation, engagement to empowerment, and observation to application. It is not that the first replaces the latter, but that we are not settling for the former. A mindset that is simply open to ‘growth’ will not be enough in a world that is asking for continuous creation of not only products, but ideas” (Couros 2017). It is important for school librarians to understand the work of education thought leaders as well as those who contribute to thinking in the library field. When working side by side with administrators and classroom teachers, school librarians should be able to relate their own background knowledge to that of their colleagues. This knowledge and ability give school librarians the use the language and meet the expectations of other educators and offer meaningful and high-impact connections between two fields of study—education and librarianship. All of the thought leaders cited in Chapter 1 promote personalized learning for students and educators in one form or another. Representing the work of The Partnership for 21st Century Learning, Bernie Trilling and Charles Fadel promote the 4Cs. Ken Robinson and Lou Arnica emphasize creativity as the cornerstone of educational transformation. Milton Chen of the George Lucas Foundation describes six innovations that support educators in developing exciting learning opportunities for students. Carol C. Kuhlthau has researched the information-seeking process and along with Leslie Maniotes and Ann Caspari offers a framework for inquiry learning. Andy Hargreaves and Michael Fullan and Peter Senge and his colleagues suggest how the system of schooling supports (or fails to support) student and educator learning. Although they may not use the term “inquiry,” the mindset and practices described in this chapter and in this book would resonate with these thought leaders. At its core, an “inquiry mindset” is about openness—an openness to explore, think, learn, create, share, and grow. How can an “inquiry mindset” promote personalized learning for students and educators? How do you promote an “inquiry mindset” in your school? Couros, George. 2015. The Innovator’s Mindset: Empower Learning, Unleash Talent, and Lead in a Culture of Creativity. San Diego, CA: Dave Burgess Consulting. Dweck, Carol. 2006. Mindset: The New Psychology of Success. New York: Random House. In her book, Professional Development: What Works (2011), Sally Zepeda provides guidance for how to form a book study group, choose a book, make decisions about how to read and discuss a book, and evaluate the book and the book study process. I have had first-hand experience participating in professional book studies and have facilitated or co-facilitated studies at two elementary schools (see Moreillon 2012, 150-151) and for one university faculty. The following are my ideas for organizing a book study specifically for Maximizing School Librarian Leadership. You can read this book and interact with it as a lone reader. You can keep a journal and write about the discussion questions and reflection prompts. Although the majority of the activities are intended for small or large groups, you may find several that you can do on your own. One way solo readers can maximize learning from the book is to post responses, thoughts, and questions to colleagues in their professional learning networks (PLNs), such as posts on email distribution lists, in Facebook groups, or in Twitter chats. Another way is to participate on this blog. School librarians may opt to read this book with a principal, district superintendent, another school librarian, educator, or administrator. 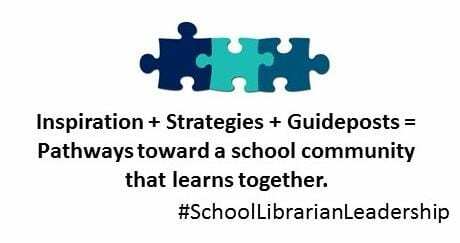 This strategy might be especially effective if one of the partners is new to learning how school librarians can positively impact school culture, professional development, and change initiatives. Small groups or larger cadres of school librarians may also select this book as a shared prompt for monthly discussions. In districts with district-level school librarian supervisors, these may be organized by the supervisor for the entire cadre. If there is no supervisor, job-alike librarians, such as all middle school librarians, may choose to organize their own book study group. A group of district-level school librarian supervisors may also opt to use Maximizing School Librarian Leadership: Building Connections for Learning and Advocacy for their own book study. The book is intended to provide inspiration, strategies, and guideposts to help site-level school librarians strengthen their practice. District-level supervisors may choose to pass on this information to the school librarians in their charge. At the end of each chapter, I provide three discussion questions, three activities, and three reflection prompts. The discussion questions are my best guesses about what you may want to dialogue about after reading each chapter. The opening quotes or the pull quotes for each chapter can also be used for this purpose. Whoever is leading the discussions in your learning environment may develop site- or district-specific questions around which readers can focus discussions. The activities are intended for partners, small groups, or whole faculty groups. They can be adjusted to meet readers’ needs. For example, the first activity in Chapter One asks readers to use a mind map to illustrate the interdependence of stakeholders and instructional activities in their schools. If you are working with a cadre of school librarian supervisors, you may each do this activity at your district level and then compare your map with those of your fellow supervisor colleagues. At the end of each chapter, there are two general reflection prompts and one specifically for school librarians. Of course, readers may create their own prompts. Responses to the prompts can be shared orally, in writing, with a sketch, or any other way that makes sense for the reader(s). When reading with a group, sharing reflections with others can be especially important to making meaning and perhaps arriving at a collective meaning from the text. In my experience, professional book groups can strengthen relationships, develop collegiality and shared beliefs and practices, influence curriculum, and help educators work together as a team. These experiences are one reason why I wrote Maximizing School Librarian Leadership as a book study selection. Next month, my blog support for the year-long book study will begin in earnest. Stay tuned for a podcast Episode 1 and for four blog postings related to Chapter 1: Building Connections for Learning. If you are reading this book with one other individual, such as your principal or your district superintendent, what will be your role in facilitating the book study and how will you ensure the success of your study? If you are reading this book with a group of colleagues—school library supervisors, school librarians, or classroom teachers for example—what will be your role in facilitating the book study and how will you ensure success for all participants? Moreillon, Judi. 2012. “Job-embedded Professional Development: An Orchard of Opportunity.” In Growing Schools: School Librarians as Professional Developers, edited by Debbie Abilock, Kristin Fontichiaro, and Violet H. Harada, 141-156. Santa Barbara: Libraries Unlimited. Zepeda, Sally J. 2011. Professional Development: What Works. 2nd ed. New York: Routledge.